There's at least one like it in every one of America's 3000 counties -- a powerhouse corporate law firm whose clients get their way and act like Republican Lords of All They Survey. 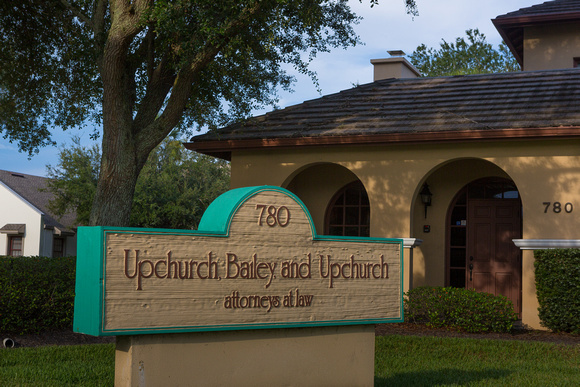 In St. Augustine, since circa 1926, that law firm has been UPCHURCH, BAILEY & UPCHURCH a/k/a the UPCHUCK law firm. When the dominant local businessman, construction contractor H.E. Wolfe ran the town and occupied the sixth floor of the six story bank building the UPCHURCH a/k/a "UPCHUCK" firm was on the fifth floor. One of the UPCHURCH a/k/a UPCHUCK firm's current clients, St. Johns County School Board, is facing antitrust investigations over possible school construction bid-rigging (only one bid for new Aberdeen K-8 Elementary School). UPCHURCH a/k/a UPCHUCK is refusing to provide a client list. UPCHURCH a/k/a UPCHUCK is admitting it never performed a conflicts check in some 20 years of School Board representation. Against this backdrop, the corporate law firm of UPCHURCH, BAILEY and UPCHURCH removed a partial client list from its website.